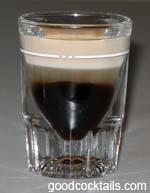 Pour in layers the coffee liqueur then the hazelnut liqueur and finally the Irish cream in a shot glass. You don't have to make it a layered drink. Just pour all ingredients into a shaker with ice. Shake and strain into a shot glass.